Outdoor Leadership 1 Edition Outdoor Leadership: Theory and Practice will help you-develop eight core competencies that are based on professional standards and are the foundation of successful outdoor leadership,-understand how to transform theory into practice through a framework that includes real-life chapter-opening stories and learning activities to help build leadership competencies, and-develop and demonstrate leadership competencies by creating a professional development portfolio that documents successful leadership experiences.Outdoor Leadership: Theory and Practice is the foundational course text and professional reference for learning and developing outdoor leadership competencies. The authors, experienced outdoor leadership instructors who have worked in a variety of outdoor settings, outline the steps to mastering eight core competencies that not only help you develop leadership abilities but also help you meet current professional standards:-Foundational knowledge-Self-awareness and professional conduct-Decision making and judgment-Teaching and facilitation-Environmental stewardship-Program management-Safety and risk management-Technical ability The book covers these competencies in a real-world context. Chapter-opening stories provide a framework for the chapter content, and learning activities and numerous examples from North America help you apply that theory and master each competency. In addition, you'll be guided through a series of activities in developing and showcasing leadership abilities through a culminating professional development portfolio. 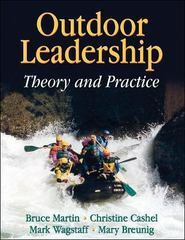 Outdoor Leadership: Theory and Practice provides the foundational knowledge required of successful outdoor leaders. Part I discusses the concepts, history, and evolution of outdoor leadership, including the diverse natural and cultural outdoor settings in which leaders work. Part II covers the components of leadership theory with chapters focusing on personal development, group dynamics, facilitation of outdoor pursuits and interpretation, and judgment and decision making. There is also a chapter on values and ethics, which includes discussion of professionalism and moral development. Part III explores teaching and facilitation with discussions on behavior and development, group development, challenge course leadership, and experiential education. Part IV explores resource and program management with discussions on parks and protected areas, environmental stewardship, program design, safety and risk management, and expedition planning. Through its learning activities, its numerous practical examples, and its step-by-step portfolio development, Outdoor Leadership: Theory and Practice will help you improve your abilities as an outdoor leader.